Fits 1958 to 1962 Big Twin models. Accel rear wheel brake cylinder assemblies provide positive brake operation and leak free performance. 100% USA made cast iron housings are precision machined to close tolerances. Heavy duty SBR (styrene butadiene rubber)cups and seals are used, located by Accel's unique patented compression spring. 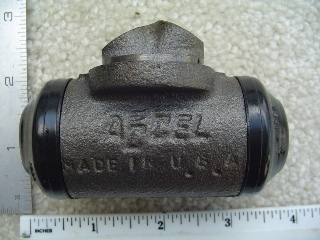 All Accel rear brake cylinder assemblies are compatible with DOT 3, 4, or 5 brake fluid.